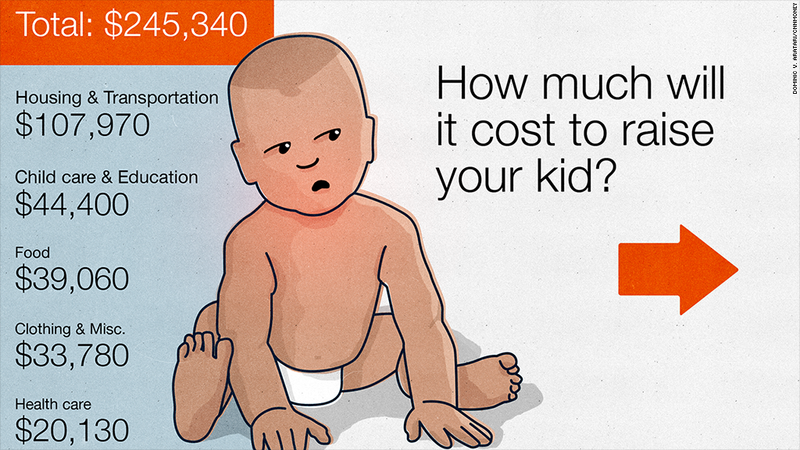 New parents be warned: It could cost nearly a quarter of a million dollars to raise your child -- and that's not even including the cost of college. To raise a child born in 2013 to the age of 18, it will cost a middle-income couple just over $245,000, according to newly released estimates from the U.S. Department of Agriculture. That's up $4,260, or almost 2%, from the year before. The figures are based on the cost of housing, food, transportation, clothing, health care, education, child care and miscellaneous expenses, like haircuts and cell phones. But the estimates don't include the cost of college -- a big-ticket expense that keeps rising. The good news: overall costs have grown more slowly in recent years thanks to low inflation, said economist Mark Lino, who has written the annual report for the USDA since 1987. But many families are still having to do more with less. The country's median income remains more than 8% below where it was before the recession, while child care and health care costs continue to grow faster than inflation. Child care, in particular, is a huge burden -- often costing as much as the family home. In 2012, center-based care for one infant was greater than median rent payments in nearly half of the states, according to Child Care Aware of America's most recent report. In Seattle, Britta Gidican and her boyfriend spend $1,380 each month on daycare for their 17-month-old son, just $20 less than they spend on their mortgage each month. "When I was pregnant I knew daycare would be expensive," said Gidican, a public relations manager. "But I didn't expect to pay two mortgages." Rising transportation and food costs are also eating up a big chunk of family budgets. Gas prices have nearly doubled since 2004, according to the AAA. Meanwhile, food prices have increased more than 13% since 2008, according to the USDA, and make up the third biggest child-rearing expense in the agency's estimate. Click on the image above to find out how much it will cost to raise your child. Kim Blackham, a mother of four and part-time marriage and family therapist, says she has seen her grocery bill climb dramatically in the past decade. Today, she and her husband spend around $1,000 each month, in part because of her son's food allergies and her efforts to cook healthier meals for her family. "I used to coupon shop, but the problem with coupons is that they are all for processed items," she said. "You seldom see a coupon for fresh fruit or meat." Use your community: From fancy strollers to bike seats, Boulder, Colo. mother-of-two Kate Lacroix said she has found a large community of people willing to share their hand-me-downs. "There is a real economy of scale when you use the village," she said. Try looking on local parenting blogs or websites to find everything from free baby clothes to a family looking to share a nanny. Calculator: Cost of living: How far will my salary go? Take advantage of tax credits: Many employers offer tax-advantaged accounts that let parents pay for health and child care expenses with before-tax dollars. Taking advantage of these accounts, and other child-related tax credits, can help you save thousands of dollars come tax time, said Bob Gavlak, a wealth advisor with Strategic Wealth Partners in Independence, Ohio. Plan (and save) ahead: When possible, expectant parents should prepare for the added costs ahead of time, said Matt Becker, a financial planner who specializes in working with new parents. First, estimate your child-related expenses and then try to save that amount each month. 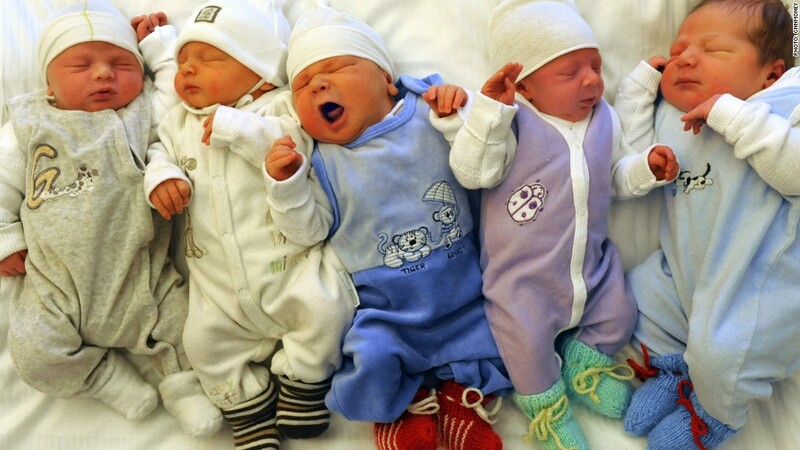 By the time your child is born, you'll be used to living without that money and also have a sizable savings built up. "Having a baby is a huge life change. You are going to have unexpected things come up," said Becker, founder of planning firm Mom and Dad Money. "Having that extra savings can help a lot."